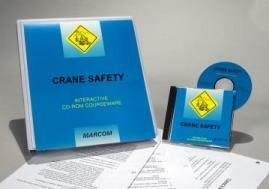 MARCOM's "Crane Safety" Interactive CD-ROM Course is designed to remind employees that over 90% of crane-related accidents are caused by human error... and that they are the key to preventing these incidents. While there are many different types of cranes, they all have the ability to make many jobs much easier by lifting enormous weight. But they also share the potential for disaster when they are not operated safely. Crane-related accidents can often be deadly, due to the cumbersome and heavy loads that are lifted. A small miscalculation, or a brief moment of inattention, and tragedy could strike. Once a load falls, not much can be done to stop it, and there is little time for people to move safely out of the way. A coworker could be injured or killed, and expensive equipment or materials could be damaged or destroyed... even the crane itself. Areas covered in the program include physical and mental preparation, equipment inspection, hazard assessment, boom cranes, jib cranes, overhead cranes, general and operational safety devices, crane operations, hand signals, and more. Using a powerful combination of audio, full-motion video, text and colorful graphics, this course provides the most cost-effective safety and regulatory compliance training available today. The course is divided into a number of logical sections so information is easily understood... and retained. Also designed with the training manager in mind, all courses in the Interactive CD-ROM Training Library include a learning management system (at no additional cost). Using this system, trainers can set up "Pre" and "Post" tests... establish log-in procedures... even define and set up curriculum for various job classes. The system also collects and organizes employee performance information through a powerful relational database, which can generate a number of record-keeping and tracking reports... and has a database "import/export" feature, which allows information to be transferred to and from an external database (such as a company's personnel database). The course is one of over 100 titles currently available in the Interactive CD-ROM Training Library.